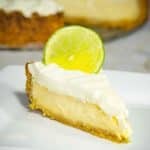 Keto Key Lime Pie Recipe - "Creamy & Tangy" - Simply Delicious! 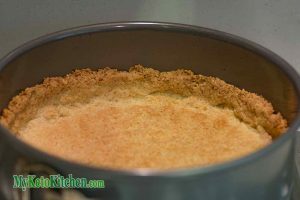 The recipe for our Keto Key Lime Pie Recipe is no longer a secret, here it is for you to enjoy. Low carb and sugar-free it's a keto dessert to behold. Combine almond meal, flax meal and natvia and mix well. Pour mixture into the base of a spring form pan and press into the base and at least 1in up the sides. Bake the crust for 12 minutes, or until golden and firm. Set aside to cool. Whisk together the eggs and sugar free sweetened condensed milk in a stand mixer on medium speed. 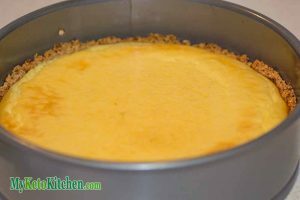 Pour the mixture into the cooled base and bake in the oven for 35-40 minutes, until there is only a slight wobble in the center. Slice into 16 pieces and enjoy. We recommend serving it with a dollop of softly whipped cream. Whip cream and spread over the top of the cooled pie. Slice into 16 pieces and enjoy.